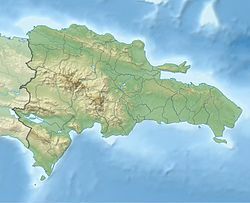 San Cristóbal is a municipality (municipio) and the capital of the San Cristóbal province in the Dominican Republic. Within the municipality there is one municipal district (distrito municipal): Hato Damas. All of these buildings are still standing, though in poor conditions. He built many monuments in his hometown, such as Balneario La Toma, and Parque Piedras Vivas- a park he ordered to be built from rocks and stones collected from each city of the Dominican Republic to honor himself (hence the park's name "Living Stones"). San Cristobal was Trujillo's favorite city as he was born here. San Cristobal Is located about 30 kilometres (19 mi) on the DR-2 from Santo Domingo and close to Bajos de Haina. It's Located near the coast of the Caribbean Sea. The topography is hilly as you go farther inland into the Cordillera Central mountain range. Goya Foods has its Dominican Republic offices in San Cristóbal. ^ De la Fuente, Santiago (1976). Geografía Dominicana Republicaaa (in Spanish). Santo Domingo, Dominican Republic: Editora Colegial Quisqueyana. ^ "San Cristobal Climate Normals 1961-1990". National Oceanic and Atmospheric Administration. Retrieved September 21, 2016. ^ "Contact Us." Goya Foods. Retrieved on March 26, 2016. "Goya Foods of the Dominican Republic, S.A. Kilómetro 17 Autopista 6 de Noviembre San Cristóbal, Dominican Republic"
This page was last edited on 25 January 2019, at 06:02 (UTC).